Select destination from earlier usage. 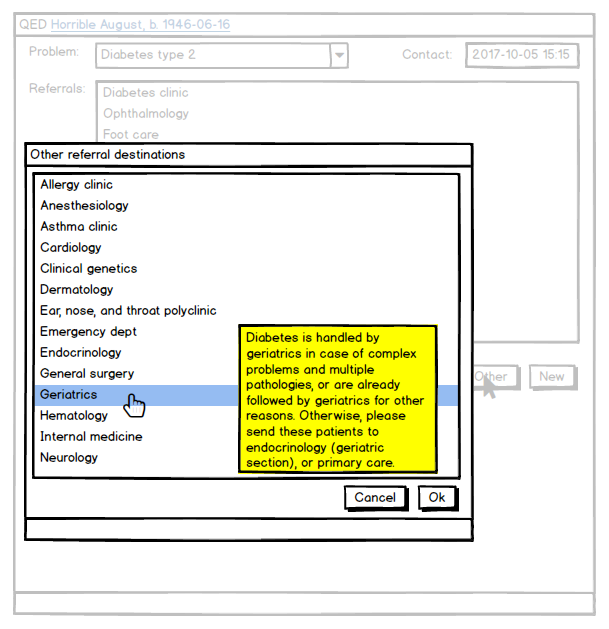 After indicating to the system that we intend to write a referral, the system shows the referral destinations we’ve1 used earlier for the same problem type. 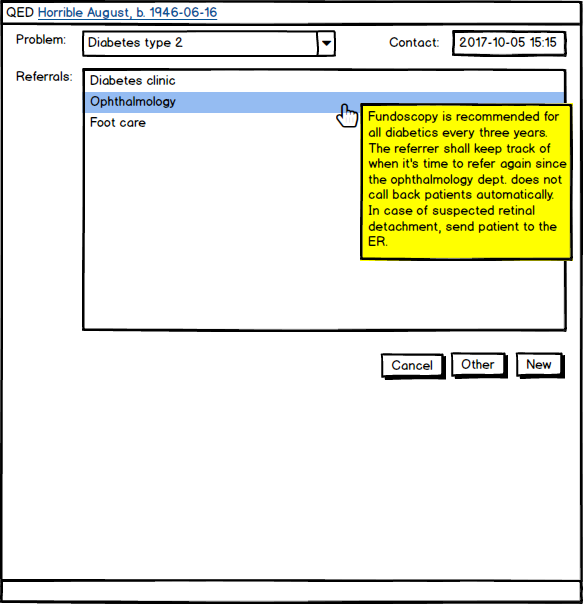 Recommendations for particular referral destinations show as tooltips. 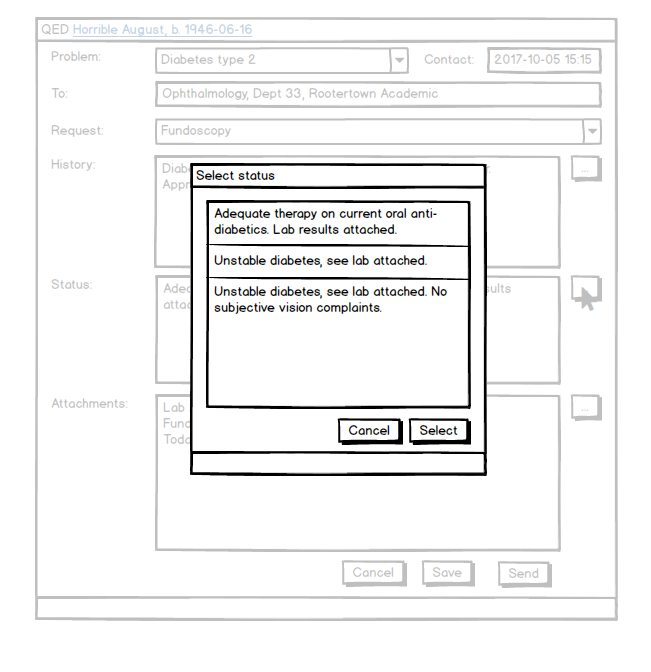 Resting the mouse pointer over any referral destination causes the system to show a tooltip with instructions and information that the referred-to department wishes the referrer to take into consideration. The great advantage is that these instructions and tips are presented at the right place and at the right time, when they are most likely to be useful. You can always select any type of referral when needed. 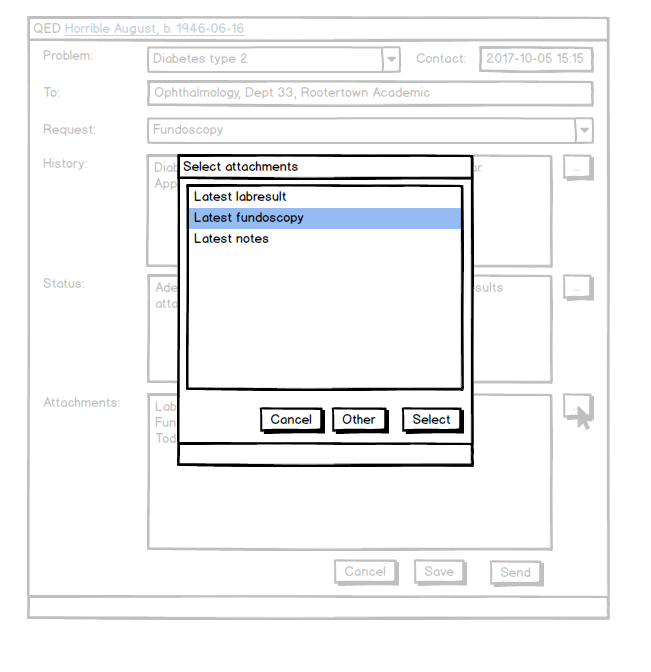 If the user needs a referral that isn’t presented in the list, they can select “other”, which results in a full list of all the receivers available in the system. Instructions and tips can be shown in this case as well2. 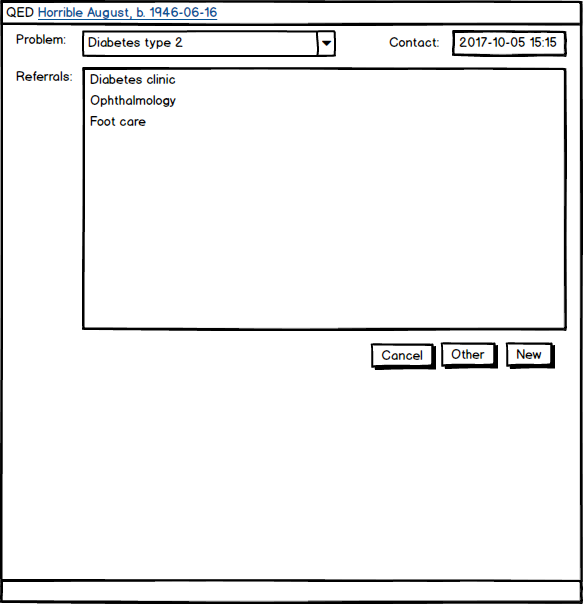 Once you’ve chosen a referral, you’re presented with a classic referral form. You can fill out the fields manually, or you can, for each field, choose from a set of preselections which can, if desired, be modified to suit the particular case. In any case, the contents of the fields will be saved for later reuse by you3 for later cases. The more frequently you use certain phrases, the higher they will place in the selection list. You can reach the preselected phrases by clicking the button with the ellipses4 to the right of each field. Select history descriptions from earlier usages. 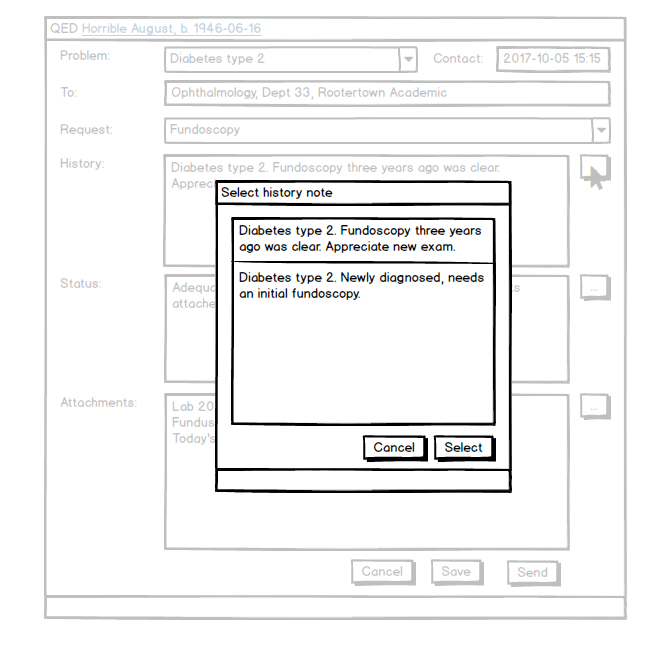 If the user clicks the button to the right of the history field, they will be presented with a list to choose from of phrases that have been used for this field and this kind of referral in earlier cases. Select status from earlier usage. Choosing phrases for the status field is entirely analogous. Choosing attachments works differently. It would make no sense to choose the same attachments as in previous cases, but it does make sense to choose the same kind of attachments. Usually one would choose “the latest” of either lab, notes, or responses to referrals. The type of referrals listed are collected from the peer group of the doctor, so referral habits become distributed within the group. Please don’t take my examples too seriously. It’s just little more than a word salad. 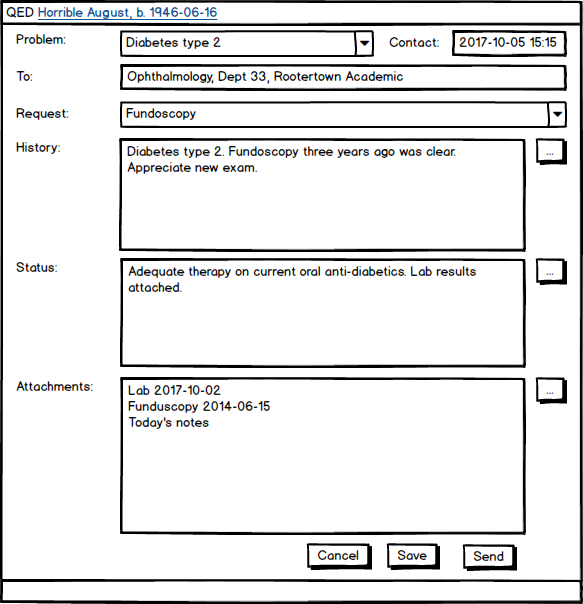 There’s a risk of information leakage if you share these phrases with other users, so for referrals, the phrases are only presented to the same user when managing later patient cases. I’m not a talented button designer.